For many years after my family went dairy free, I didn’t have a good recipe for dairy free pumpkin pie. That is until I stumbled across this recipe about 4 years ago. I would love to share where I got the recipe, but I can’t remember. I fairly sure it was in our local newspaper, but I really don’t know. I was just so happy to find a recipe for pumpkin pie, that was dairy free to try. It’s also vegan too, which is great if you have a vegetarian coming for Thanksgiving dinner. I also have a vegan recipe for stuffing. 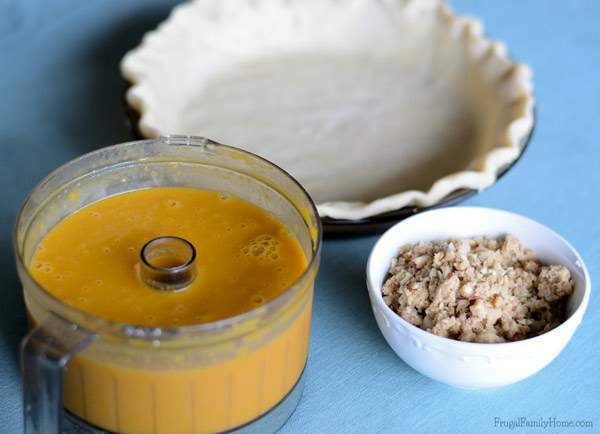 I’ve made this pumpkin pie recipe with canned puree and homemade fresh puree. Both work great in the recipe. If you are using pumpkin puree that has been frozen and then thawed, be sure to drain any of the watery liquid off, before adding it to the recipe. The original recipe calls for maple syrup. But I never have real maple syrup on hand, I use the maple pancake syrup I make myself. It works very well in the recipe too. I make my own pie crust, but I do believe that some of the ready made crusts from the store are dairy free too. I use shortening in my pie crusts, since we can’t eat butter. But margarine that is diary free would also work. Be sure to use the stick margarine and not the tub margarine. I like to fold under the extra pie crust that falls over the edge of the pie pan. Making the edge of the pie crust a little thicker helps it bake at the same rate as the pie filling. I do find that with my homemade pumpkin puree, I need to bake the pie a little longer than with the canned puree. 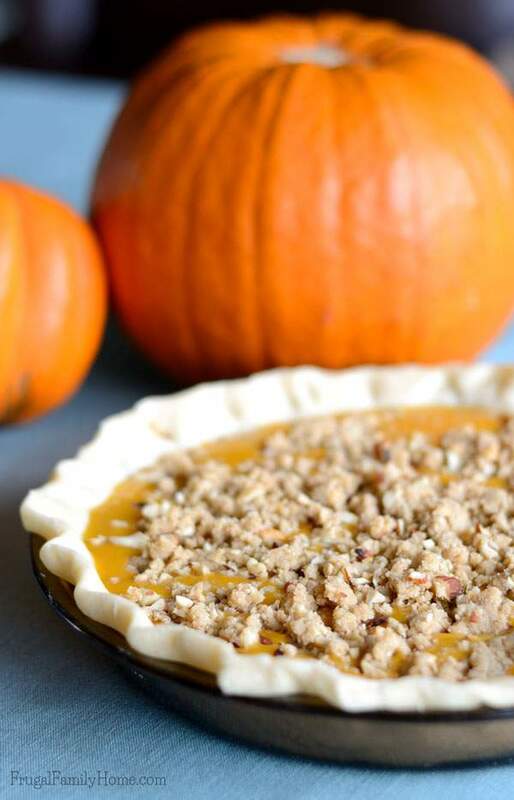 This pie recipe has a really nice crumble topping to add to the top of the pumpkin pie. It can be left off and the pie turns out great too. But the extra flavor and crunch is nice. This pie keeps well, in the refrigerator. 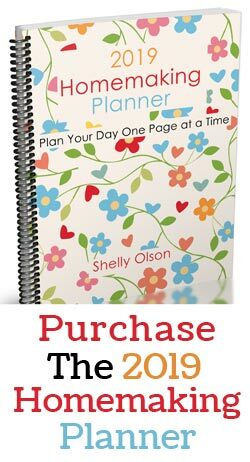 It’s great to make ahead and have it ready to go before the holiday. 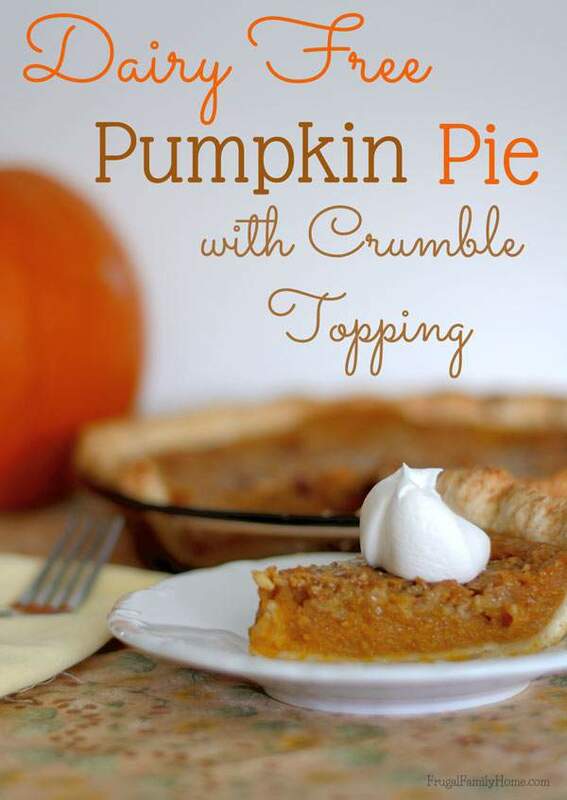 An easy diary free and egg free pumpkin pie with crumble topping. 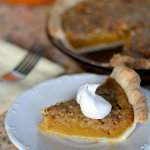 This vegan pumpkin pie is simple and easy to make but tastes just like classic pumpkin pie. Mix the brown sugar, flour, nuts and cinnamon. Cut in the margarine until mixture is crumbly texture. In a food processor, add the pumpkin filling ingredients and blend until smooth. 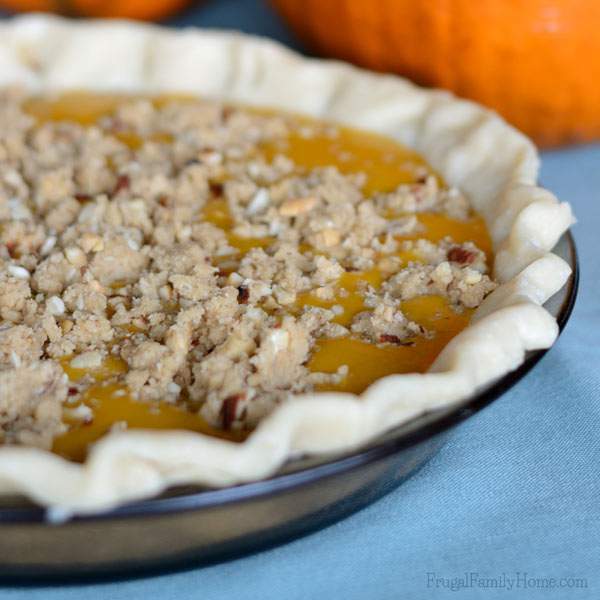 Add the pumpkin filling to the pie crust. Sprinkle the pie with the crumble topping. Bake at 375 degrees for 40-45 minutes. Pie may looks a little unset in the center but will set more when it cools. What’s your favorite Thanksgiving dessert? 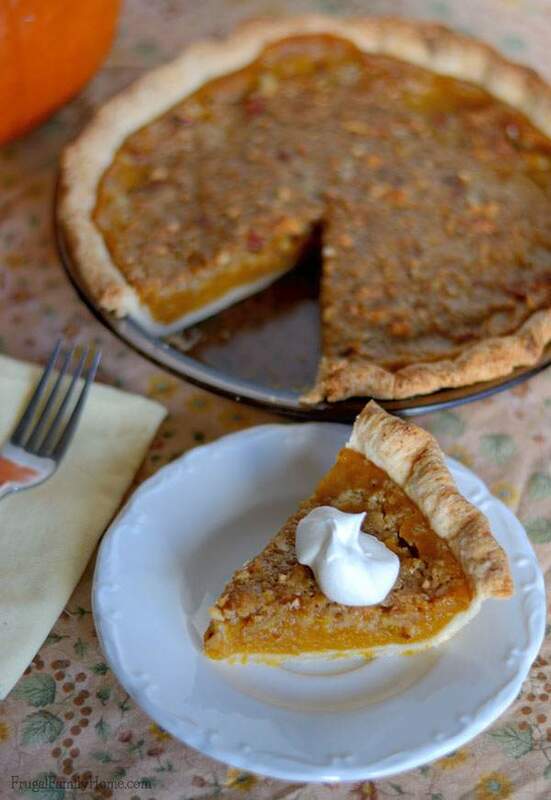 Are you traditional and go with pumpkin pie or does your family have a different favorite dessert? I was hoping you would share that recipe! Looks wonderful and I love that it seems so simple. So many of the Vegan dessert recipes I run across seem to have 575 overwhelming steps and so I skip them. My family likes chocolate pie for dessert but my favorite has always been apple. Of course, it also would not be Thanksgiving without a pumpkin pie on the table. Jean, chocolate pie sounds good too. Oh the pecan pie sounds really good! I made one a few years ago. But now you have me thinking about it, I may have to make one for Christmas. Looks lovely! I’m mostly dairy free and processed food-free so I bring the pies to Thanksgiving with my family – I use an amazing grain-free crust recipe from Beyond Bacon by Paleo Parents, and I think last year I modified the classic Martha Stewart recipe but used full fat coconut milk instead of the evaporated milk. It turned out great!! What a delight to find what I call..good basic recipes without dairy…thank you. 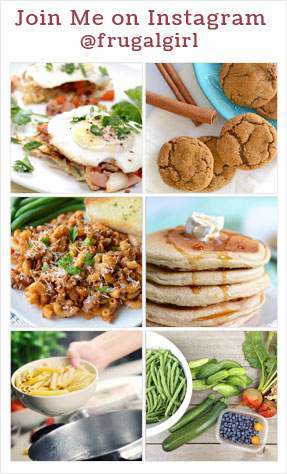 The pudding recipe really excited me and now to find pumpkin pie…you are a treasure! Now I am also allergic to soy so my question is can I sub almond milk for the soy milk in this recipe? Thanks so much. Sandra, I’ve never tried almond milk but I don’t see why it wouldn’t work. Let me know if you give it a try.